Pro-velodrome protestors maintain the rage at Greater Dandenong Council''s meeting on 25 February. Greater Dandenong Council has been blasted for spending money like a “game of Monopoly” by fast-tracking the demolition of Maurice Kirby Velodrome in Noble Park. A majority of councillors have voted to expedite $450,000 for the cycling track in Parkfield Reserve to be removed as soon as March. It had previously been expected to be funded in the 2019-20 budget to be handed down in June. In a spirit of “even-handedness”, the council compounded the issue by also exploring $450,000 out-of-budget spending on the Burden Park masterplan in Springvale. At a council meeting on 25 February, councillor Matthew Kirwan said there was no valid reason to “leapfrog” normal budget processes. He said normally such requests would be considered as part of annual and mid-year budget planning. “This officer recommendation tonight treats our budget like a game of Monopoly. The cited reason for the fast-tracking of the Parkfield Reserve project was to avoid expected rains in winter and spring. “It is quite understandable that residents have come to the conclusion that weather conditions are being used as a flimsy excuse to hide what they see as the real reason – to satisfy the obsession of this council to destroy this loved local velodrome as soon as it can,” Cr Kirwan said. Cr Sean O’Reilly opposed the Parkfield Reserve motion, then successfully proposed a report into spending $450,000 of 2018-’19 funds on the Burden Park masterplan. Earlier, he’d said he supported the velodrome’s demolition but not outside “normal budget consideration”. “It’s the exceptions that crack the integrity of our budgetary process. “Let’s keep our budget process transparent and consistent. The monies are to come out of the Open Space Reserve Fund, which consists of unbudgeted extra revenue. Councillor Tim Dark, who moved for the velodrome’s hastened demolition, told councillors that “we’re going around in circles”. He said it was necessary to take action due to safety issues and conflicts with soccer and cricket teams using the reserve. The project has been the subject of impassioned debate, with the reserve’s tenant cricket, soccer and tennis clubs in support. The plan includes an expanded cricket oval and new practice wickets, an extra soccer pitch, upgraded and relocated tennis courts and a new shared pavilion for the three tenant clubs. Noble Park-Dandenong Cycling Club re-formed last year, basing itself at Parkfield Reserve in an attempt to save the velodrome. 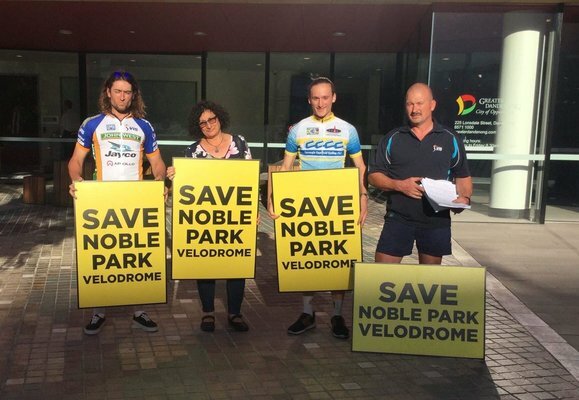 Members, including Kim Nguyen, were among a group of protestors with Save Noble Park Velodrome placards in the gallery. “I think those reasons given for the (fast-tracked) demolition are just beyond belief. “The reason is clear to anyone following the campaign – they want the velodrome gone, to not have it brought up at council meetings anymore. After the meeting, Cr Kirwan moved a recission motion to stall the proposed demolition. The matter will be voted upon again at an 12 March council meeting.